Am I going to buy Hellraid just because of the interactive YouTube trailer? Yes! From Techland, the makers of Dead Island and the forthcoming Dying Light, comes Hellraid—a first-person hack and slash dungeon crawler where you explore swamps, tombs, and prisons in search of loot and weapons to upgrade your character. You and up to 3 of your friends can have it out with skeletons, zombies, and one really pissed off horned-demon on roids in a system-generated online world where the loot drops and enemies are consistently changing. 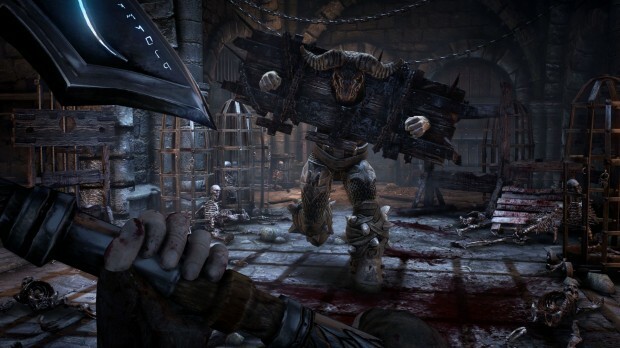 The combat looks methodical, much like Techland’s games before it; with swords, shields, magic staffs, and axes at your disposal to pick apart the demonic hordes. An interactive YouTube trailer was released called Edyn’s Escape where you click between two choice paths to progress to the next video. Surprisingly, I really enjoyed it. It was short, but the atmosphere was stifling and dungeon-y, and there was a moment of hesitation before each choice on whether or not I was making the right decision. Most of the time I did, but when I didn’t, around the next corner was a demon or monster waiting to lodge a battle axe into my neck. I had fun. Hellraid wasn’t even on my “raid”ar (sorry, I couldn’t resist) prior to today, but if I liked the YouTube trailer “game” as much as I did, I am at least interested to see how the actual game plays when it comes out sometime in 2013.